This cookie gets its creaminess from cream cheese, which also adds a little tang to the cookie base. That slightly tangy, creamy richness balances nicely with the sweetness and acidity of raspberry jam, which is my preferred choice of filling. Play around with various jams–use what you love. It could be strawberry, apricot, blueberry, or you can even be more playful with unique preserve flavours. Make a variety of them from one batch of dough to get a colourful assortment on your cookie platter. The variations and flavour combinations can be endless, depending on what jam you choose to use. The added cream cheese in the cookie also helps create a texturally beautiful dough. It holds together perfectly when rolled into balls and doesn't crumble, as some recipes are apt to do (from personal experience). I have frozen these cookies (already baked) successfully, so you can have some now and save some for later. 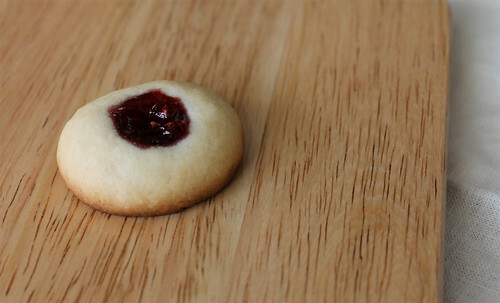 Just be sure to freeze them in single layers on a sheet first before placing them in an airtight container or freezer bag; otherwise, you'll end up with a jammy mess. 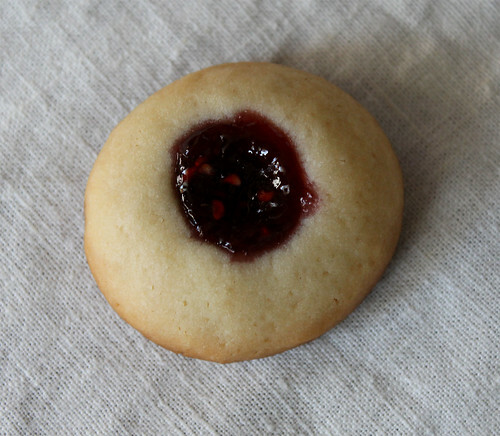 You can find the recipe for Raspberry Cream Thumbprints here. Melody Fury // GourmetFury.com December 16, 2011 at 2:00 p.m. These were utterly amazing. I'm going to pop another one in my mouth right now :) Thank you Bon!